All bright gold tint in a gloss and polish finish. Volan 3/4 deck and fin patches. Fiberglass leash loop. Black & white WOOD logos. Single 1/8" Darkwood stringer. Glassed-on double foiled Finnish Birch Ply twin keels. Length: 5' 8" Width: 20 7/8" Thick: 2 1/2"
Nose: 16 3/4" Tail: 16 7/8"
The FREEDIVER is Micah Wood's blend between traditional and modern fish design. With single to double concaves, hand foiled wood keel fins, S-glass for extra strength, 3/4 deck patch and a fiberglass leash loop. 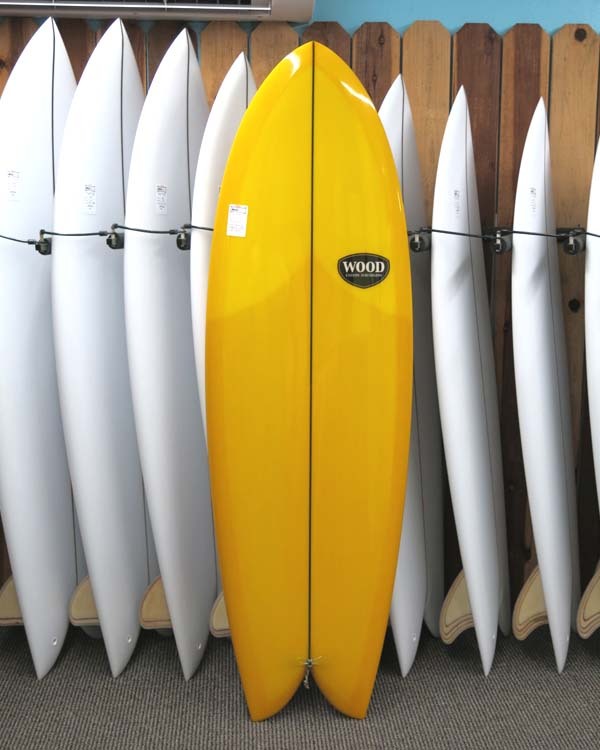 It's Micah's newest shortboard shape with all hand-made details. Hand shaped & glassed of polyurethane foam. Shaped and signed by Micah Wood.